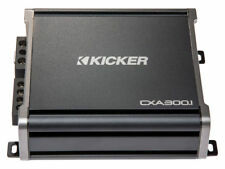 Kicker CX Series CXA300.1. Kicker factory refurbished product gives you an opportunity to buy amazing Kicker product at the lowest prices possible. Kicker takes this product through the refurbishing process: first they test every product to find out what's wrong, once diagnosed a Kicker tech at Kicker will fix the product, then run it through a series of rigorous tests to ensure all problems have been fixed and send the products to us for resale. 500W RMS x 1 @ 2 Ohms. Mono subwoofer amplifier. Class D amplifier design. Variable low-pass filter (50-200 Hz, 12 dB/octave). Frequency response: 10 Hz - 150 Hz. Speaker-level inputs. High Efficiency Mono-block Class D Amplifier. Damping Factor Greater than 100. S/N Ratio Greater than 80. Frequency Response 10Hz - 200Hz. Power @ 1 Ω 16V 2800W. Power @ 1 Ω 14.4V 2300W. Power @ 2 Ω 14.4V 1300W. 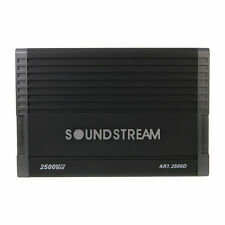 Soundstream Arachnid AR1.2500D. 2500 Watts Max Power, Monoblock Class D Car Subwoofer Amplifier. Max Power (Watts): 2500. 12dB Bass Boost Increases Low Octave Harmonics. Virgin Islands and other countries outside the USA. RAGE 2500.1. Bass Boost Frequency: 45HZ. Input sensitivity: 4 V-0.1V. Frequency response: 15 HZ-200 HZ. Low pass crossover: 20HZ – 200HZ. Crossover circuit: 24 DB/OCT. 2 OHM 1500W. Damping factor: >300. 3000 WATT MONOBLOCK CLASS D. 1-Ohm Stable Class D Monoblock Amplifier. POWER ACOUSTIK BAMF1-3000D. AMPLIFIER WITH REMOTE BASS KNOB. Direct Short, Thermal, and Overload Circuits Protect Amplifier. Die Cast Aluminum Alloy Heatsink for Optimum Dissipation. Reference HD3000 - 2 OHMS. Max Output Power @ 13,8 VDC - 2 OHMS: 3598W RMS. @ 13,8 VDC - 4 OHMS: 2446W RMS. @ 13,8 VDC - 8 OHMS: 1403W RMS. @ 12,6 VDC - 2 OHMS: 3000W RMS. @ 12,6 VDC - 4 OHMS: 2040W RMS. 750w CEA Rated! Amazing Quality and Engineering! Rockford Fosgate R12001D. We are an Authorized ROCKFORD FOSGATE Dealer! Rigid, Smittybilt, ARB, Westin and hundreds more! Trending at $254.88eBay determines this price through a machine learned model of the product's sale prices within the last 90 days. The Quantum Audio QA4000D replaces the older QCA4000D. The new look of the amplifier is much nicer, and it will match the style of any install. 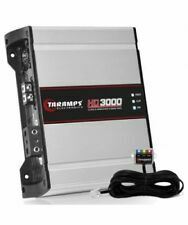 The QA4000D is a 4,000 watt mono-block car amplifier. DB DRIVE OKUR A6 2800.1D. db Drive A6 2800.1d 2,800W Okur A6 Series Class D Monoblock Amp 2800 WATT MONOBLOCK. 1 Ohm @ 14.4 Volts - 1 x 2800 Watts. CLASS D POWER AMPLIFIER. Continuously variable 18 dB bass boost. AUTHORIZED AUDIOPIPE DEALER. Rms Power: 1,800W x 1 @ 4-ohm. Rms Power 3,000W x 1 @ 2-ohm. 3-way protection circuitry (thermal, overload, and speaker short protection). Put the completed RMA FORM inside the box with your item. Hifonics 35th Anniversary 2400 watt Hercules LTD mono subwoofer car audio amplifier with built in electronic crossovers and bass remote included. At very high listening levels. Hifonics Super D-Class results in lower distortion, higher current efficiencies and less heat than conventional D-Class amplifier designs. HIFONICS BRX2016.1D. BRUTUS SERIES CLASS D AMPLIFIER. Brutus Series Monoblock Class D Car Amplifier. 2000 WATT RMS MONOBLOCK. 3-way system protection circuitry (thermal, overload and speaker short protection). At very high listening levels, Hifonics amplifiers with Super D-Class circuitry result in lower distortion, higher current efficiencies and less heat than conventional D-Class amplifier designs. Classic aluminum Hifonics design to minimize heat build up on the Ultra-Fi™ output devices. Skar Audio engineered the RP-3500.1D Class D monoblock subwoofer amplifier to be dominant in both power and reliability compared to anything else on the market in its' class. Skar Audio RP-3500.1D Monoblock 3500-Watt Class D MOSFET Subwoofer Amplifier. Audiopipe APMN2000. MPN APMN2000. Condition NEW. Product Details. Trending at $215.87eBay determines this price through a machine learned model of the product's sale prices within the last 90 days. Car Audio Class-D Monoblock 1-Ohm Stable Amplifier. 3-way protection circuitry (thermal, overload, and speaker short protection). Mono channel operation. 4 ohms: 1600 watts x 1 channel. 2 ohms: 3300 watts x 1 channel. Car Audio APMI Series Class-D Monoblock 1-Ohm Stable Mosfet Amplifier. Mini Line Series Monoblock Class D Car Amplifier. Mono channel operation. Low Level Input Sensitivity : 200mV-5V. Variable Bass Boost (0 to 12 dB bass boost at 50 Hz). Pioneer GM-D8701 1600W features Class-D topology and the dedicated subwoofer channel runs on high efficiency Class-D. 1x Pioneer GM-D8701 1600W Amplifier. Class-D technology Amplifier. Continuous Power (RMS) Output at 1 Ohm: 800W RMS x 1. Trending at $139.67eBay determines this price through a machine learned model of the product's sale prices within the last 90 days. Hifonics 35th Year Anniversary LTD HS35-3000.1D Amplifier. SUPER CLASS-D MONOBLOCK AMPLIFIER. Super Class-D 1-Ohm Stable Monoblock Amplifier. The efficient and audiophile grade electrical components are secured to double-sided military grade glass resin epoxy circuit boards. This Audiopipe APHD-3000D-H1 is a 3000-watt amplifier built on a mini chassis to provide serious power in a tight space. For the size, quality, and power this amp is hard to beat! For more information see specifications below. DS18 CANDY-XXL1B (BLACK). DS18 Digital Monoblock Amplifier. Don’t sacrifice comfort for better sound when you can simultaneously have both. 3000 WATT DIGITAL MONOBLOCK. CLASS D AMPLIFIER WITH BASS KNOB. Class-D 2 ohm Stable Monoblock Amplifier. 3-way protection circuitry (thermal, overload, and speaker short protection). 2 ohms: 300 watts x 1 chan. Input sensitivity Mono channel operation. Soft start turn-on. 8000 Watts Max, Monoblock Class D Car Subwoofer Amplifier. 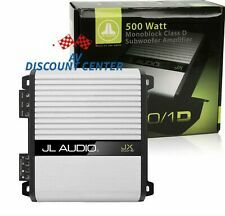 Monoblock Class D 8000 Watts Max Car Subwoofer Amplifier. 1-Ohm Stable Class D Monoblock Amplifier. 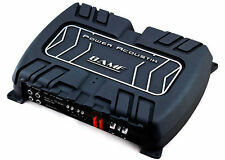 Power Acoustik BAMF Series BAMF1-8000D. Direct Short, Thermal, and Overload Circuits Protect Amplifier. Alpine MRV-M500 Car Amplifier. Alpine MRVM500. mono subwoofer car amplifier. Rigid, Smittybilt, ARB, Westin and hundreds more! 8-1/4"W x 2-3/16"H x 7-15/16"D. CEA-2006 compliant. Trending at $114.49eBay determines this price through a machine learned model of the product's sale prices within the last 90 days. With its super efficient Class-BD circuit topology, the P1000X1bd assures maximum BOOM for your buck! Due to its dedicated low frequency response, this amplifier is optimized for mid-bass speakers or subwoofers only. Looking for strong bass?. Kicker's CXA600.1 mono amp can send up to 600 watts RMS to your subwoofer. An optional wired remote lets you conveniently adjust the bass level from your front seat. Kicker CX Series CXA600.1. DS18 EXL-X7K1. 7000 WATT MONOBLOCK CLASS D. The EXL-X7K1 is competition-quality amplifier. AMPLIFIER WITH REMOTE BASS KNOB. 3 Year Warranty. Sorry no APO's, FPO's, Po Boxes, Alaska, Hawaii, Puerto Rico, or CODS. Universal Class D Mono 2000W Amplifier by Audiopipe®. Boasting the latest in technology, this first-rate amplifier from Audiopipe is the finest piece of competition car audio gear that will take your listening experience to a whole new level. Versatility is key, and so you have the ability with the SKv2-1500.1D to run them strapped if desired, which is unique to our SKv2 series of amplifiers. Skar Audio SKv2-1500.1D 1,500 Watt Monoblock Class D MOSFET Competition Grade Subwoofer Amplifier. Kicker factory refurbished product gives you an opportunity to buy amazing Kicker product at the lowest prices possible. Kicker takes this product through the refurbishing process: first they test every product to find out what's wrong, once diagnosed a Kicker tech at Kicker will fix the product, then run it through a series of rigorous tests to ensure all problems have been fixed and send the products to us for resale. Max Output Power @ 13,8VDC - 1 OHM: 3575W RMS. Max Output Power @ 12,6VDC - 1 OHM: 3000W RMS. Max Output Power @ 13,8VDC - 2 OHMS: 2355W RMS. Max Output Power @ 13,8VDC - 4 OHMS: 1365W RMS. Max Output Power @ 12,6VDC - 2 OHMS: 2025W RMS. Car Audio Monoblock 1-Channel Class D Amplifier. 1-ohm Minimum Impedance Monoblock Operation. Total power output: 10000 watts. Direct Short, Thermal, & Overload Circuits Protect Amplifier. Digital Bass Reconstruction Processor Built-in. Stable, durable circuitry lessens the risk of high input power for the unit to achieve 1 O connection. This design enhances the flexibility to connect multiple subwoofers to a system. RCA Inputs: MONO. DS18 ELITE Z-9K1D. DS18 Elite Z-9K1D 9000 Watts 1 Channel Class D Monoblock High Performance Power Amplifier. Remote bass knob included with all models. CLASS-D MONOBLOCK AMPLIFIER. 9,000 WATT COMPETITION GRADE. APMN Series Monoblock Class D Car Amplifier. 3-way protection circuitry. Max power output: 2000 watts. Variable Bass Boost: 0 to 12 dB bass boost at 30 - 80 Hz (variable). Variable low-pass filter: 40 - 180 Hz. The BASS 3k amplifier module, is carefully designed with the highest technology, and high performance for automotive sound systems focused on subwoofer and bass response. MAXIMUM POWER@ 14,4 VDC - 1 OHM: 3000 W RMS. Audiopipe APHD-3000D-H2 2 Ohm Stable Monoblock Mini Amplifier. This Audiopipe APHD-3000D-H2 is a 3000-watt amplifier built on a mini chassis to provide serious power in a tight space. For the size, quality, and power this amp is hard to beat! Max Output Power @ 12,6 VDC - 1 OHM: 5000W RMS. Frequency Response 10Hz - 10Khz (-3dB). Punch EQ: 0-18 dB @ 45Hz. Crossover Frequency: Variable 35-250Hz LP. Hifonics BRX2416.1D. BRX2416.1D Amplifier. 2400W Monoblock Brutus Series Class-D Amplifier. Brutus Series 2400W Monoblock Class-D Amplifier. 1 ohm: 1 x 2400W. Heavy duty aluminum alloy heat-sink with illuminated Hifonics logo.